We all want the best for our families, but working out which best stroller for twins is right for you, with all the different options available, can give you a headache. Strollers are never a simple purchase, and as the mother of twins, you've got your work doubly cut out for you. That's why we put together this twin stroller guide. In it, you will find the double strollers on the market that are worth a consideration, from frame strollers for newborns all the way to high end city twin strollers. A frame stroller is a stroller designed specifically to be used with your babies carseats for the first few months of their lives. The smart design means that you take the car seats straight out of your car and clip them directly onto the frame, because it has no seats of its own. This means maximum safety, because your children are always safely ensconced in their protective seats, as well as less disruption for them, which is doubly important when there's tired eyes or grumpy, teething twins around. 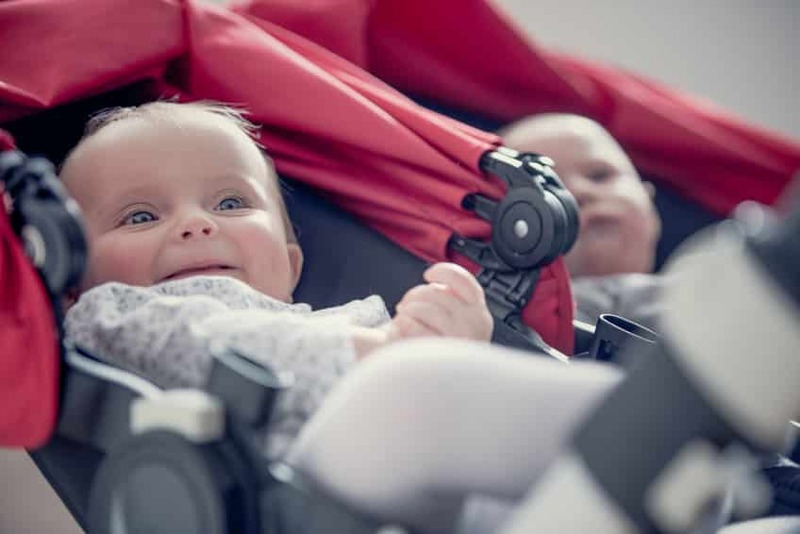 The major upside of frame strollers compared to normal stroller for twins, apart from what we've just discussed, is the fact that they weigh almost nothing when compared alongside normal strollers. 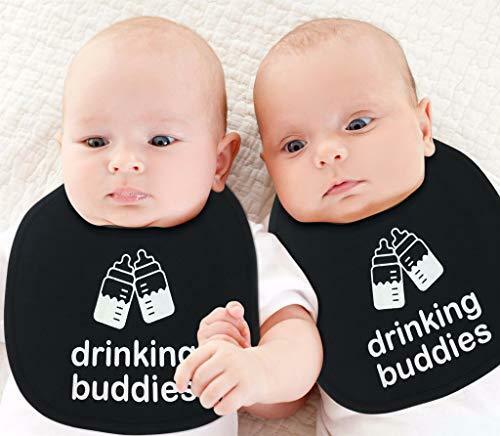 This means it's easy to take them everywhere with you, even if you think you might need it. And if you've got a smaller car, it saves room for all of the other things you're going to be taking with you, diapers, bottles and everything else. Space really is a premium when you're the proud mother of twins, and you know as well as I do that you're thankful for anything that lessens the load. When you're buying a frame stroller, you're going to want to look for something that's easy to set up and take down, and strong enough to take the weight of your babies without having to worry. If you already own car seats it's also important to make sure that they will fit. Most frame strollers have adaption kits that allow them to take almost any car seat, but it's always nice to double check. It's also normally worth keeping an eye out for storage space. It's not drastically important on a frame stroller, as long as you've got enough space for your diaper bag, but anything extra is always a plus. This is a very basic frame, but don't let that put you off. It's a good starting frame that's definitely strong enough to do the job you need it to do, considering how long you'll own it. For a lower priced model, this has a lot of options. The seats are laid out in stadium style, which means the back seat is higher than the front one, giving both babies a decent view of the world and you. The seat fit itself is robust, with adjustable fittings under the seat to hold everything in place, but it's worth double checking when you buy it that it will take your seat, as a few brands struggle to lock in. You can still make it work, but it feels like effort that's unnecessary. Apart from that, though, this is all golden. There's a huge amount of storage space underneath, as well as cupholders above, so everything you need can be accommodated. Just bear in mind that, as a budget model, this won't stand up to the same level of punishment that other brands might. But go into this with that understanding and you'll be fine! This is our other universal frame stroller for twins, and compared to the Baby Trend model, it's a bit heavier and a lot tougher. There's a lot more to like than just robustness, though. 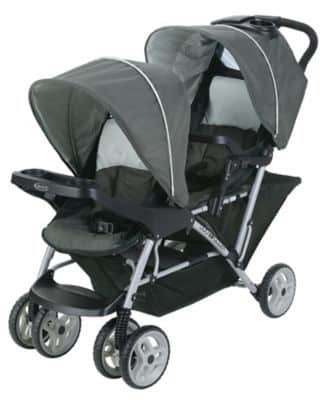 With a unique side mount feature that gives you instant access to both babies, this is a great double stroller, especially for twins who still constantly want to see your face, as well as parents that like to keep a close eye on what's going on. It fits any car seat with little issues, and there are adapters available for pretty much every major brand, so no matter what you've got, this will fit it. Whilst this is a solid twin stroller, that does make it little on the weighty side. Thankfully, it's pretty easy to steer, and can go damn near everywhere. My mother's house has a side door, and this would get through with no issues. It's also possible to fold this flat with just one hand, which is just great convenience. Overall, this is a higher quality stroller with more options, and it's a great purchase for any mom who needs ease, convenience and security in one package. There's a lot of questions to ask when you're looking for a stroller for twins. As you look over our reviews, try and keep some of these questions in mind and think about your families particular needs. How easy is this going to be to push? Weight. Obviously, the more your stroller weighs, the harder it's going to be to push. This isn't the be all and end all though, because smart design choices can completely change how a stroller reacts when you're behind it. When you're looking at the numbers, I'd recommend you remember that it's not just the stroller you have to push, but your kids and probably a load of baby gear as well. Wheel design. There's a lot of variation when it comes to wheels. Bicycle style, air inflated, rigid, suspension cushioned. Front mounted. Fixed or rotating. Generally, better quality wheels will make using it a whole lot more comfortable, as well as much easier to steer. Braking and stopping. Where is the brake. How easy is it to use? Is it something you can accidentally hit by mistake? All of these things matter when you're around town and doing jobs. How comfortable is this going to be for your babies? This is the other main thing to look out for in a stroller for twins, and in my opinion the main thing. After all, there's nothing worse than going on long journeys and being uncomfortable. We've all been on a plane without enough room, and that's miserable even if the destination is somewhere exotic and warm! Look for deep seats that have a lot of mobility and space. The ability to recline is great, as are anything that you can adjust as your kids grow and get bigger, like footrests. Finally, consider things like the sun and rain. Does it have a canopy or weather cover? Is it going to be big enough? How simple is it to fold? We'd all like to have infinite space but sadly that's not reality, and at some point you're going to want to fold your stroller back up. Even if it's just to throw it in the back of the car when you're travelling. If you don't see yourself needing to fold your stroller up often, for example if you have a lot of garage space, then you can pay less attention to this, but it's still an important consideration. The top strollers have systems built in that allow you to fold down and assemble them quickly, easily and with the minimum of fuss. Sometimes even using only one hand. And having a free hand is really useful when you've got young ones around right? We touched on this, but on long journeys you'll be thankful to have enough space to empty your pockets and get that bag off of your shoulder, as well as dumping everything you might need into your stroller, and more. Storage varies massively, with some strollers holding a decent sized shop and some only having enough room for a diaper bag and a few extras. More storage is generally better, so take it if you can find it. Does it fit car seats? This is becoming more and more popular, as baby travel systems get more and more advanced. It's at the point now that high end strollers allow you to take a car seat straight out of the car and lock it into place directly into the stroller, which is great if the current occupier happens to be taking a nap. Not all seats fit into every stroller for twins, and some strollers might not have this option though, so it's something to consider. Durable and effective, this stroller for twins is great for moms who like to take the little ones out into the great outdoors a little more, or anyone who lives closer to nature. The all terrain tires make this simple to push, no matter what you're rolling across, and the rear foot brake means that you can stop it in a second. Don't let this make you think that this isn't good for city life though, because the same features mean you'll be darting down the street with all the safety and control you could ever ask for. The seats are large, with multiple reclining positions and have five point safety harnesses, the same sort that you'd see in sportscars! So no unexpected tumbles, even with the bounciest baby. It's got a solid amount of storage space underneath that will easily hold several bags of shopping, plus there's two cup holders and a storage tray on top for everything you need to get to fast. Finally, even though this is a big stroller with a lot of weight behind it, it breaks down really fast and folds flat with the minimum of struggle, meaning you'll be able to fit it places you really wouldn't expect! This is definitely a good choice!. For convenience and ease of use, this is an excellent stroller for twins. It's relatively light when you compare it to a lot of twin strollers, and the swivel wheels with suspension make it incredibly easy to push and turn, ideal when you're loaded down. The seats are comfy, with the option for a flat recline on the back one, which is perfect when the little ones get tired, and each seat has an individual adjustable canopy and footrest, keeping everybody comfortable on long journeys. It's really simple to flatten as well, once you're done, with a design that can be triggered with just one hand. Storage space is nice, as well, with twin cup holders and a large underside basket that can be accessed without having to disturb either seat. There are a couple of niggles, like the fact that the rear seat can sometimes be tough to get in, but overall this is a great dual stroller and one that any mom would be proud to own. Simple to steer, turns on the spot with no effort! In terms of smooth, comfortable rides for your babies, it's hard to beat this stroller making is a strong contender for the best stroller for twins. For starters, it's got an adjustable suspension system and weight distribution that I would be proud to put on my car, reducing bounces and keeping everyone inside happy. Then there's the tyres, which are air filled rather than solid, like you'd find on cheaper strollers, which reduces the shock of any bumps you might go over. Second, it's comfortable for you, with a multiple height handlebar that's good for anyone, from midgets to giants, and a set up and two step fold down system that's incredibly useable, even for first time parents. Obviously, it's simple to drive, but it's probably even easier than you think, with the swivel locking front wheel making even the tightest turns a cinch, and the option to lock it in place for long walks or jogs. The storage space is really generous, with an underside tray as well as multiple pockets, plus it comes in a variety of colors, so you're free to match it to everything else you own. Because there's no reason not to be stylish, if we have the option, right? A classy, eye catching option, Joovy's Scooter X2 is available in a huge range of color styles, all of which look impressively high end. When it comes to using it, it's just as good as it looks. There's a lot of storage for you and your kids, with underneath storage, multiple rear pockets and top mounted cup holders. It gets around well with good quality wheels and a great braking system. The seats are really comfortable, and set quite far back, under an absolutely enormous canopy that can pretty much cover anyone inside completely! So no matter the weather, whether it's pouring down with rain or hot sun, your babies will be snug and safe inside. It's pretty compact, too. Even though it's a side by side stroller, it still fits through normal sized doors! I just wish that it was a little easier to fold down. The mechanism that unlocks it is hard to reach, and once you've got it folded it doesn't stand very well. Despite this though, you've got a really pretty, easy to handle stroller for twins that's perfect if you're looking for a side by side model. If you want to turn heads at the park or nursery, then you're going to want this stroller for twins. The design is really distinctive, and it comes in a wide variety of colors which all look great. The seats are deep and comfortable, and recline all the way, with a good sized canopy hood with viewing windows so you always know what's going on. It's a joy to push, as well, with large sized wheels and an adjustable handlebar that's comfortable and not hard on the hands, plus a hand operated brake that's always in reach, just in case. There's a generous amount of storage, too. Underseat trays as well as back mounted pockets. It's just quality, all the way through. Finally, it folds down into a compact and simple to store mode with just a couple of movements. Strong, durable and really well made. When it comes to options, this is the stroller to beat. It's packed full of innovative and useful technology, so whatever your family needs, this can provide it. On top of that, there's a lot to love about the basics. From the fact that it's a double seat stroller for twins that only takes up the same area as a standard, to the seats that can be set in any fashion that you could want, or even the huge sun canopy with built in UV 50+ sun protection. It's supposedly heavy, though I'd challenge anyone to say that this was hard to move. It's made from sturdy, top quality materials, with lightweight, low profile wheels that turn easily and have the option to lock when needed. It can take a little bit of getting used to though. Specifically, setting it up and putting it away. Bear in mind that all these options mean this is a little more complicated than the more basic strollers. But you'll get the hang of it in no time. No matter the needs of you and your growing family, there's a stroller out there that will meet them. Now that you've read our guide, hopefully you've got a better idea of what you're looking for. Maybe you've even found the best stroller for twins. Either way, as long as you take the time to think about what you're buying and why you need each option, you're sure to choose the stroller that will fit your needs.